I almost forgot, in the midst of a cold and mountains of work, that today is Food Day. While last week was World Food Day, today is America’s Food Day, a time to tell Congress to support sustainable, locally grown food, improve access to healthy, affordable food, cut subsidies for factory farms, and more good stuff. 1. Tell your representative to support the Eat Real Agenda. You can view the letter here or send your own message. 2. Check out the 6 Food Day Principles to get a sense of the major issues that the Agenda seeks to address. 3. Exercise your right to buy organic, shade-grown chocolate, made of high quality beans and real health benefits and remember…the higher the bean quality, the more money the farmer receives. My recommendation for this week is a chocolate bar that is indeed grown, from pod to bar in this very country! Hawaii is the only part of the U.S. that has the right climate (areas 20 degrees north and south of the equator) to grow cacao. 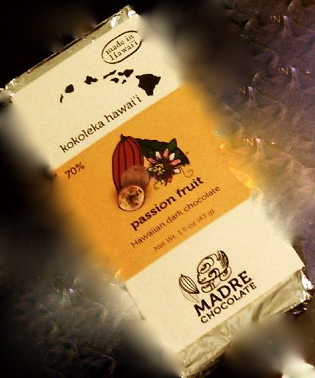 This weekend, I was able to check out the NW Chocolate Festival and taste this delectable little bar from Madre company: – a 70% with real passion fruit. A little on the sweet side but I love passion fruit and the flavor really comes out. I talked to one of the makers and am glad to report they promote organic, sustainably grown cacao of the highest quality, in addition to working directly with the farmers. You can order through their site and hopefully, as they grow,and with your support, this chocolate will be soon be sold widely across the country. Stay tuned for the story of chocolate and my series on sustainable chocolate companies. I will divulge what I learned from the Chocolate Fest this week too, including the controversies surrounding Fair Trade certification. Can’t wait to hear more about sustainable chocolate companies and the controversies surrounding Fair Trade certification. I am loving this blog. Now I am just wondering if we are going to get to sample some of this chocolate the next time we meet! Theo is located in Seattle just down the hill from me! Yup, I’m very familiar with Theo! They were on the top of my must visit list back when I first came to Seattle. I recommend their factory tour if you haven’t done that. While Theo is the first organic bean-to-bar factory there are a few more companies since that have also sprouted up that are bean to bar (small-batch makers that don’t have a factory). I will showcase them after I do my piece on Theo. Also, when I talked to Theo’s Joe Whinney, he explained that he’d made the move to Fair for Life certification as it freed up more money to contribute directly towards the farmer cooperatives they work with. Which is great! Just to clarify, Madre Chocolate in Hawaii are beyond bean to bar because their bars are actually made in the place of origin, where the beans are grown. i.e. no shipping of the beans, and ultimately, more local profit 🙂 There is nowhere else in the U.S. where this is possible.